Anyone who follows this website closely will already know that Newport played a key part in the development not just of the Welsh language but Wales’ present-day identity. The very physical presences of Caerleon, the Great War Memorial, St. Woolos Cathedral and the Westgate Hotel stand as monumental features within Welsh History as a whole. Recently another, much more nebulous, identifier has begun to seriously infiltrate the British social consciousness with a series of nationally broadcast dramatic events – Welsh Football. The exploits of the national team at Euro 16, and Cardiff and Swansea in the Premier League are perhaps the most obvious examples. But a special mention should also be made for Newport County FC, a club driven into financial and actual extinction 25 years ago. Revived and restored to the national stage of the Football League by the grit and good fortune of its supporters, they have made media headlines for the last two years. Firstly, by way of a final day escape from relegation and latterly by defeating and holding their own against teams from higher leagues in the FA Cup. To do that once would be commendable, County have defied all logic and expectation by repeating the scenario all over again with, at the time of writing, the prospect of more to come. The national media reaction to County’s triumphs have ranged from the sympathetic – articles on the existence battles mentioned above – to the bombastic. On the morning of Tottenham’s visit last year, one Sunday redtop highlighted this with the headline “Spurs enter the den of the Welsh ‘Crazy Gang’”. The word ‘Welsh’ in this context is highly emotive, bringing visions with it of something decidedly un-English, savage and alien. In reference to a club who owe their foundation to immigrants from the West Midlands attracted by employment in the ironworks and booming docks of the 19th Century town, it provides further example of Newport’s particular ‘Welsh’ identity and continuing contribution to a ‘Welsh’ consciousness. Football, without doubt, the single most important sport in British culture and arguably one that is becoming pre-eminent within Wales, does not possess a comprehensive academic historiography. There are volumes galore on the lives of notable players, clubs and matches but little in concern with relationships between the social and economic interactions of supporters, clubs and geographical areas. For a recent study of football clubs in border communities, read Robert Bevan’s PhD thesis ‘Oswestry, Hay-on-Wye and Berwick-on-Tweed: Football fandom, Nationalism and National Identity across the Celtic borderlands’ which considers the ‘Welshness’ of TNS and Hay St.Mary’s. A brief flourishing of works by journalists and essayists in the late 1990’s were largely subsumed into the ‘literati’ circles of London with one stand-out example ‘The Far Corner’, a journey by public transport – “a mazy dribble” – through the football heartlands of North-East England bucking the trend. Perhaps this was because the author, Harry Pearson, a native of Great Ayton and Middlesbrough FC devotee had forsaken the bright lights and coffee of Islington for the very different attractions of rural Northumberland. 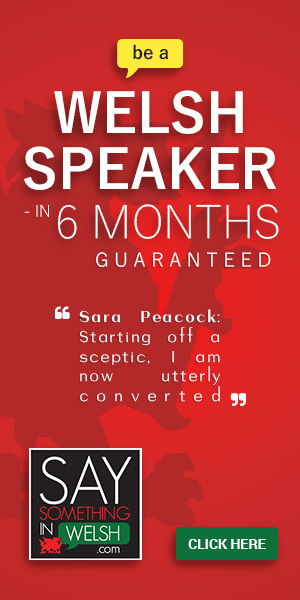 Pearson’s book has been reprinted several times despite – or perhaps because of – its frequent incursions into the vernacular, unintentional humour discovered in places such as Tow Law and Seaham Harbour. It provides a rare insight into the functioning of football as a unique social barometer. The Tees Transporter Bridge, Middlesbrough (left) and The Newport Transporter Bridge, Uskmouth (right). 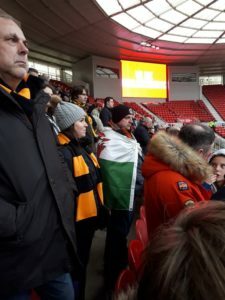 It is fitting therefore that Middlesbrough becomes the main reference point for examination of Newport’s Welshness as represented by its football supporters. The surface links between the two communities are physically massive, not least in the shape of the only two remaining transporter bridges in the UK, with their joint histories of heavy industry attracting large number of immigrants intertwining completely. Drawn against the ’Boro in the fourth round of this year’s FA Cup, County were once again cast as outsiders facing a team two full divisions above them. With the knowledge that over a thousand County supporters were due to be at the match – a 700- mile round trip for most – there was little chance of a less than raucous occasion happening. The final uniting thread, the one that attracted many media articles – more than the merits of the players- came in the form of Newport’s oldest suburb, Pillgwenlly. The name, one of many that can be traced back to the 6th Century Prince Gwynllwg, was faithfully reproduced in full as background to the ‘Boro and County managers, Tony Pulis and Mike Flynn both having been born and raised there. The 11.38 train going north from York that morning had been packed with County supporters, hardly any from Newport itself but ex-pats with a large London contingent and individuals from as far as Dover and Plymouth. The traditional black and amber County colours dominated the atmosphere and it was very much a ’Newport’ rather than ‘Wales’ atmosphere. This mood continued in the pubs adjacent to the rail station but a subtle, steady change occurred nearing the ground with a sprinkling of Welsh flags and hats. Inside the stadium, a sprinkling of Welsh flags embroidered ‘Newport County’ were very much in evidence. Intriguingly, only one English flag was displayed by the home support. 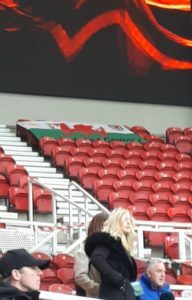 The County support did give full voice throughout and it was not surprising that the ‘Don’t take me home….’ chorus that had dominated the Welsh terraces during Euro 2016 and is by now a de facto National Anthem sung by supporters of Wrexham, Cardiff and Swansea whenever they cross the border boomed out loud and proud. Many of those earlier seen on the York train caught the return journey an hour after the game ended in a spellbinding stalemate – County equalising in the last minute. Drawn games act as mediators between opposing spectators, suddenly they have common ground for discussion and animosity becomes an alien concept. 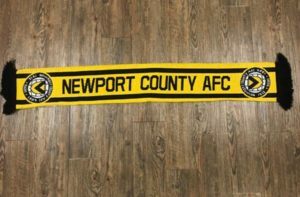 Placing this in the context of Newport’s history of split loyalties it seems that the result was a most appropriate one. Appreciated values from both sides of the Border are embraced to enrich their erstwhile enemy; bombastic, illogical demonstrations are fleeting in nature; compromise becomes the way forward. 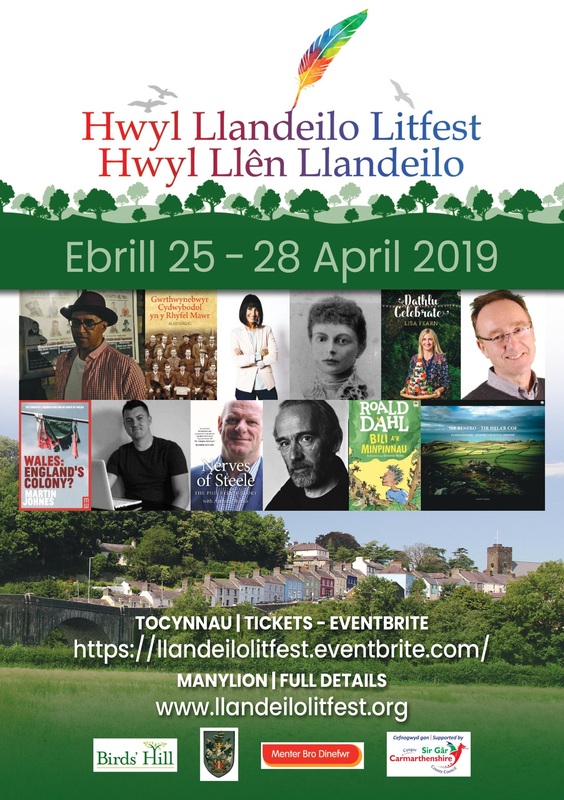 On this same train, a supporter from Monmouth gave an impassioned account of the campaign to introduce dedicated Welsh education into the town, possibly the last place in Wales where such a move could be thought to be made. As he explained, it as if the reintroduction of the Welsh Language by way of the physical presence of a school building has produced a local debate in excess of any predictions. People in the area have become fired-up and passionate in argument. 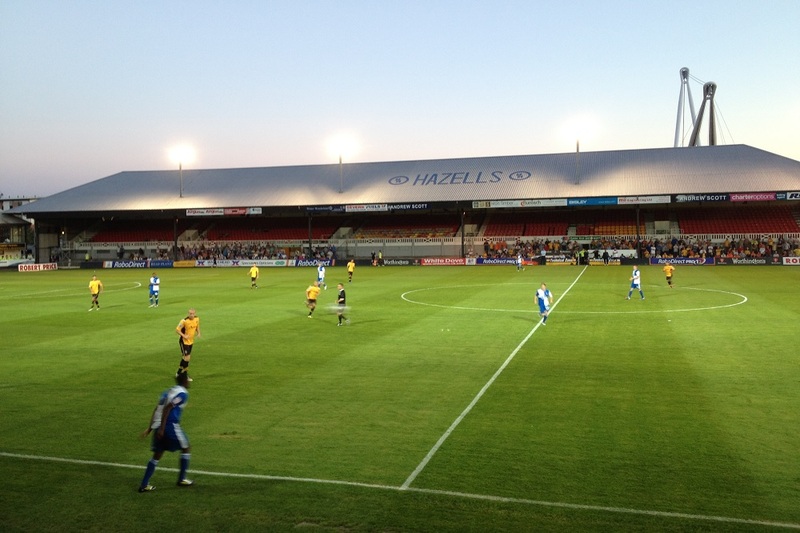 Taken in the context of Newport County’s long history of struggle to establish a particular identity, something largely unreported as it mostly existed in the lower leagues of an essentially English football structure, a synchronicity arises. The exporting of ‘Welshness’ by football supporters and the internal importing of the Welsh Language both serve to solidify the Nation by strengthening Identity. Newport, and its bridge, had taken a huge step forward as Welsh place.